Autumn is my favorite time to ride. The fall of 2007 was when I took up riding in the first place, so every year it feels like coming home. It’s a season of change, and a season of uncertainty. Any given day from September on could be gorgeous, could be cold, could be wet or all of the above. It’s also the time of year when the inevitability of the Minnesota winter draws me to my motorcycle with fresh enthusiasm. The convergence of weather, schedules and the occasional breakdown can conspire to make any given motorcycle ride the last of the season and by extension, the last of the year. So any sunny, Twin Cities afternoon gets special consideration for riding any bike I can get my hands on. Beg, borrow, or steal — if I can help it, I’m on two wheels. The weather this season has been so bizarre. From a cold, wet spring, to the hottest, most humid summer on record — squeezing in a ride has been challenging. Add to that the project status of my entire small fleet of bikes, and I thought I wouldn’t get any decent riding in all year. Autumn has thrown me a bone though. It’s been an Indian Summer these past few weeks. Unseasonably warm weather plus whole weeks of nearly uninterrupted sunshine have let me put much-needed miles on the CB750 Robb brought back from the dead for me. Hastily planned overnight trips into Wisconsin and even moto commuting to the office have helped to reclaim a season I thought was lost for sure. I’m even optimistic that (knock on wood) we’ll get in another outdoor Third Thursday next week. I’m not the only Blue Cat out enjoying that autumn. Ryan’s rockin’ the Bonneville and the hot rod as the colors change. Rumps has the CB350 growling all over the neighborhood. 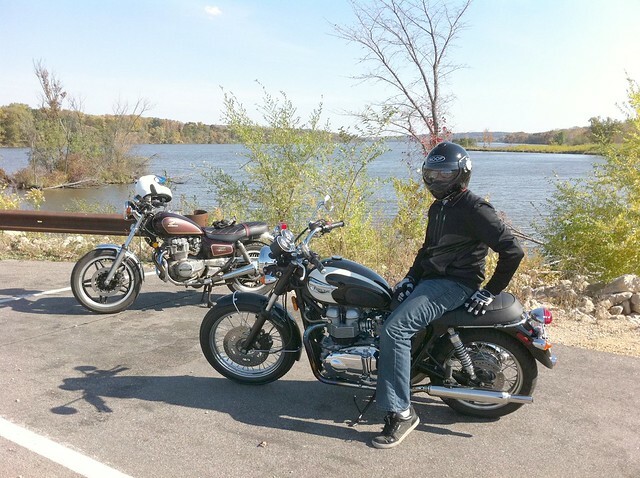 Over the weekend, I took The Mrs’ CM400 out for a jog with my buddy Bree, who’d just procured a new-to-him Triumph Bonneville T100. We’d pulled over at a scenic, mid-ride stopping point on Mooers Lake to take a rest and enjoy the scenery. The occasional Harley gargled by as a couple local boys tried to fish in peace. Not five minutes went by before I heard the familiar rasp of old Japanese aluminum. I looked up the hill to see a familiar gold-and-white Honda coming down the winding road. It was Jeff. Of course it was Jeff! Who else is rocking a gold, Canadian Honda? He and his lady were off to the orchard, her little Honda complete with a picnic basket on the rear rack. Does it get any better than that? Could that be any more autumnal if it tried? Nope. Not unless you could carry a campfire in a sidecar. Back at the shop, bikes are still coming and going, though more and more are going these days. People are getting every last mile out of their motorcycles and scooters before winter comes. With fewer new machines in, more bikes are getting fixed and sent home. This is a good thing though. Healthy bikes and a clearing back room means we’re that much better prepared to start taking winter storage bikes at the end of this week (starting October 15). Looking back, it’s been a great year, and it’s not over yet. 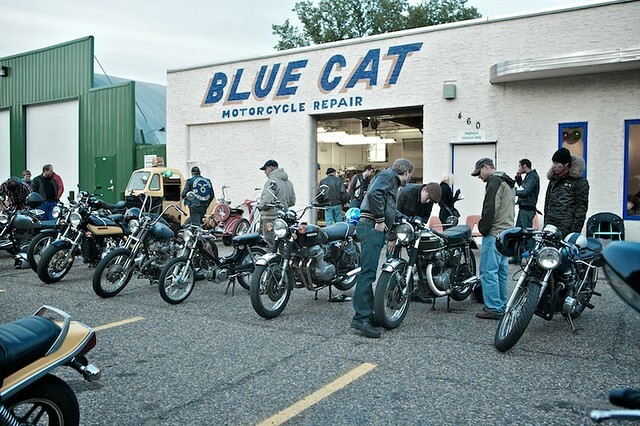 The local motorcycle community has really embraced us as we’ve reinvented ourselves in a new space, focused on service. We’re thrilled and extremely grateful for all our new and returning customers. We’ve been wall-to-wall bikes all summer and that’s the best kind of busy. So to everybody who brought us a bike this year, thanks! We wouldn’t be here without you. As we get mentally and logistically prepared for winter, we’re enjoying what autumn is giving us so far. It’s looking like a great way to cap off the season. Have you been out riding? What are your favorite colors routes? Have you planned your winter project yet? Sure, winter may keep us Minnesotans from riding, but that doesn’t mean it has to slow us down. Quite the opposite, really. There’s winter service to do, and we’ve got something really fun and really fast in store for next year once the Earth heads back towards the sun. Until then, start bringing us your winter storage bikes on the 15th and get in on Winter Service if you’re game.